Last week, I took a break from laying paving stones for walkways and a patio to dig and plant the first flower bed for my new front garden. 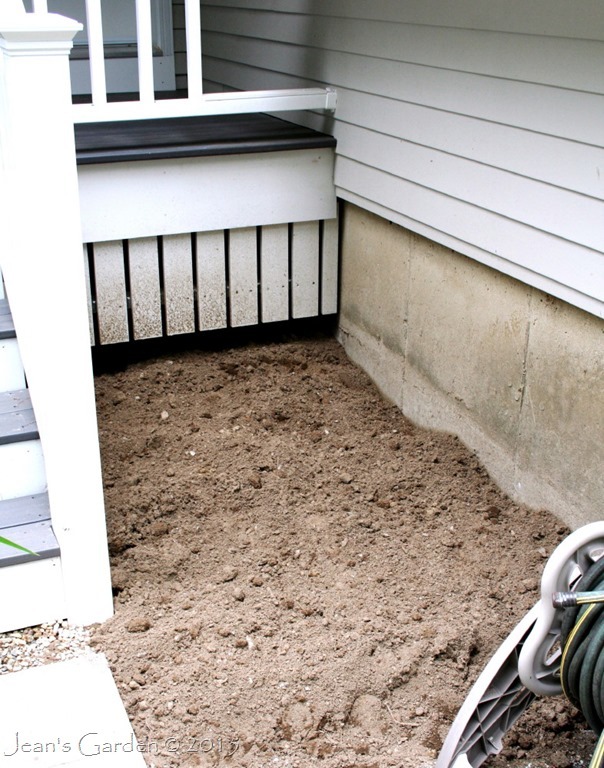 This is a very small flower bed (only 6.5’ x 3.5’) to fill the space under the window between the front of the house and the front entry steps, so it did not take long to do. Once I removed the weeds that had grown up here since the construction ended, the soil was easy to prepare. Most of this had been part of a previous flower bed (the iris bed under my old bow window) and it hadn’t been part of the excavation for the new foundation, so the soil was in good shape. I removed some stones that had landed here during construction and mixed in three buckets of compost to renew the soil. Then I let it settle for a day before adding plants. My original intention was to recreate a version of the iris bed that was planted under the old front window. This was mostly a planting of blue Siberian irises, with some Tradescantia ‘Zwannenburg Blue’ to extend the bloom season. In this smaller space, I decided to include 3 clumps each of Siberian iris and tradescantia and to extend the season still more by adding two clumps of a blue aster (Symphyotrichum laeve ‘Bluebird’) that were not being shown to their best advantage at the back of the blue and yellow border. I also decided to lighten up the color scheme by including not only the much paler blue of these asters but also one clump of Tradescantia ‘Osprey,’ with it’s white and blue flowers. When I finally got around to doing a quick sun study of this area, however, I discovered that the back corner of the bed got less than 2 hours of sun (and this during the sunniest part of the summer), so I substituted a hosta for one of the Siberian iris clumps and put the hosta in that corner. 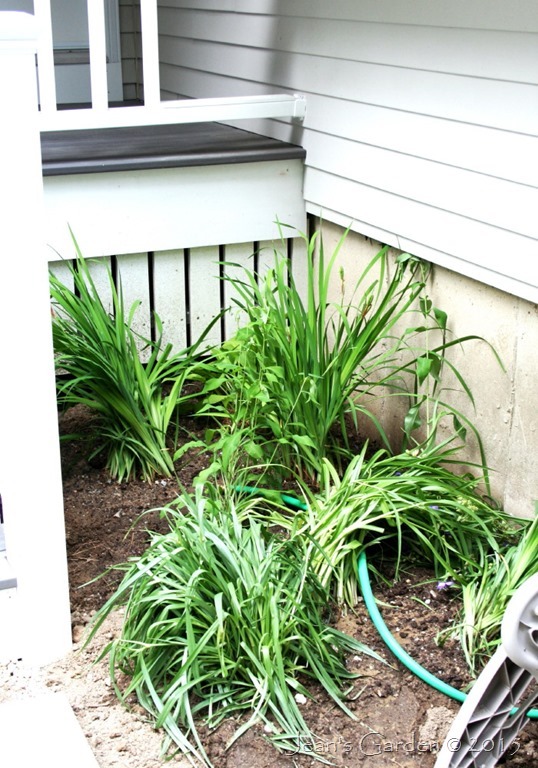 All the plants for this flower bed just needed to be dug up and moved from other parts of the garden – mostly from the holding area that I created for plants that were rescued from the old front flower beds before construction began. I popped them out of the ground with my garden fork, piled them in the wheelbarrow, transported them to their new location, and got them back into the ground quickly. The hosta and irises went at the back of the flower bed, closest to the house and to the front entry landing; the two asters went near the middle, and the three tradescantia were planted closest to the front, with ‘Osprey’ at the front corner closest to the walkway. Since the plants were only out of the ground for a few minutes, I expect them to adapt to their new home quickly and easily. Tradescantia ‘Zwannenburg Blue’ has continued to bloom uninterrupted. Most of the plants are looking a little droopy, but I’m watering them every day while they settle in. With this flower bed done, it’s time to go back to laying paving stones. That looks like good soil, Jean. I’m sure those plants will settle in very nicely. Helen, If I remember correctly, you and I share the affliction of very sandy soil. So good soil in my garden is soil that has already been heavily amended at some time in the past. The plants are settling in nicely. Already, by this morning, two of the tradescantia plants had stopped drooping. Interesting selection of plants, I’m not familiar with those varieties of Tradescantia. You are very industrious! Jason, These are cultivars of what are called the “Andersonia group”. In 1935, Anderson and Woodson proposed that many of the varieties of T. virginiana were really hybrids of T. ohiensis, T. subaspera, and T. virginiana. Apparently, the hybrid designation was never accepted for lack of sufficient documentation, so these are treated as cultivars of T. virginiana. They self-sow readily in my garden and ‘Osprey’ seems to come true from seed, which argues against it being a hybrid. It’s always exciting to start a new bed. I hope this one performs as expected. LOL, Pat, I don’t know that any flower bed ever performs as expected. There are always surprises and disappointments and revisions and second (and third and fourth) drafts. I feel as though this is what makes gardening special, that you are creating art with living beings who don’t bow to your will. I’m glad you took a break from your more strenuous hardscaping task to work on a bit of the fun stuff, Jean. It’ll be great to see the area come to life. Kris, The break from hardscape was nice. This week, I got back to it and now have 3/8 of a patio. July is typically the hottest part of the summer here, so not a good time to plant. I should have all the hardscape done by the end of July and then can spend August and September on flower beds. I’ve been moving plants, too, into a new bed in a ‘new’ house. I’m improving the soil at the new house, but it is pretty bad – heavy clay. Still, I think most plants are doing well. It helps a lot if plants don’t have to be out of the ground for long. Pat, I don’t envy you your heavy clay. I had heavy clay in my Gettysburg garden, and it could be like trying to dig through bricks when it was dry. If I have to amend soil, I’d much rather begin with my easy-to-dig glacial sand. A nice combination. 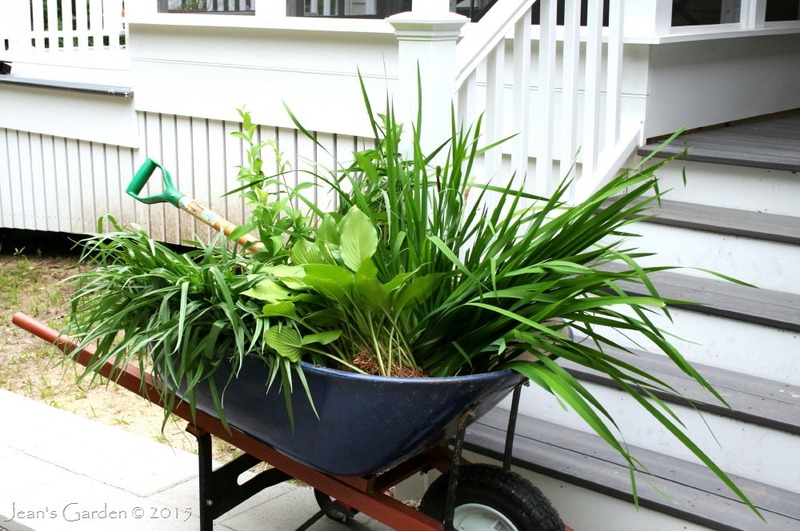 You must be happy to have this planted … no gardener likes to look at a weedy or unplanted bed. LOL, Joene, right now my entire front-garden-to-be consists of weedy unplanted areas. This small flower bed is an oasis of order in the chaos. Hi Jean, I look forward to seeing this new bed establish and grow. From the position it is in, I would call it “The Border Under the Stairs” as I can just see a set of steps to the left in one of the photos. Your Blues Border should be a welcome site near your front entrance. You could almost call this an instant garden, since you had well-developed plants to start with. I guess they are a little droopy because, being mature, they were set in their ways and are having to take a bit of time to adjust! Deb, You’re right about the instant garden. A lot of the plants going into the new front garden beds will be chosen from the holding area where plants were moved before the construction began. So every bed will have some mature plants to jump-start the garden.